Event raises more than $300,000 for patient programs and services. On July 31, more than 325 people attended Calvary Hospital’s 29th Annual Golf & Tennis Classic at Brae Burn Country Club and Century Country Club in Westchester County. The event raised over $300,000 for Calvary programs and services to benefit both patients and their families. 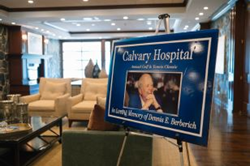 Each year, proceeds from this event’s tennis portion support the Dennis Berberich Scholarship Fund for a Calvary Care Technician, who is part of the nursing department. This year’s honoree is Nisi Eapen, who joined Calvary as a ward secretary in 2010 and became a CCT in 2015. Nisi is now pursuing her RN -- and ultimately her degree as a nurse practitioner -- at the College of Mount Saint Vincent. Frank Calamari (left) and Dennis Berberich (right) are pictured with Nisi Eapen (center), the winner of the 2017 Dennis Berberich Scholarship for Calvary Care Technicians. Family members of Bill Tully Sr., a long time and faithful supporter of Calvary Golf & Tennis outing. Although Bill passed away in 2016, his family still continues to support this event. Joe Deglomini Sr. (2nd from right) with his guests at Calvary’s Golf & Tennis outing. Pictured (left to right): Tim Barr, Christopher P. Comfort, George Irish and Jamie Stewart.